When we hear of Bitcoin’s use case, we often get to hear many narratives. But to me, one of the fundamental use cases is to be able to allow value transfer from one person to another or one business to another in a totally transparent and censorship-resistant way. Satoshi Nakamoto made this possible with his creative genius powers almost a decade ago. Today, years later, Bitcoin continues to serve that purpose; which simply means it works marvelously. That’s why business around the world have started accepting Bitcoins for their trades. However, if I don’t accept the fact that many have actually started ditching BTC due to the recent exorbitant transactions fees, I would be wrong. That’s not a problem which cannot be solved, and cryptographers, as well as developers, are working on solutions such as Lightning Networks and Atomic Swaps to make Bitcoin very much relevant for payments. Amazon via Purse: This is little known secret that you can buy products from all Amazon store using Bitcoin. The best part is, you will be saving anywhere from 1-30% when you use Bitcoin. Purse is a well-known service that let you achieve this. For detailed tutorial, read how to buy Amazon products using Bitcoin via Purse. Newegg: Newegg an online retailer of items including computer hardware and consumer electronics. Cointracking: This is a cryptocurrency portfolio app that accepts Bitcoin as payment. This is what we use here at CoinSutra for managing the portfolio. ExPressVPN: A popular VPN service that accepts Bitcoin as a payment option. PureVPN: Another VPN service that accepts Bitcoin as a payment. For more options, check out no logs VPN. Expedia: A popular travel company that aggregates hotel and flight prices for you on demand for free. Overstock: A popular online shopping store that sells virtually anything you would need. Microsoft: Microsoft is accepting Bitcoin for Windows and Xbox sales. eGifter: An online gift cards & group gifting company that accepts BTC and LTC. KFC Canada: KFC needs no introduction and this a significant step towards mass adoption. NameCheap: The ICANN accredited domain registrar also accepts BTC for domains and web-hosting. Gyft-Is an online gifting website where you can buy a gift for Bitcoin. Subway: It is a fast food restaurant franchise that primarily sells submarine sandwiches and salads. Bitcoin.Travel: Book your travel flight tickets, hotels, rentals, cars, tours and activities and plan your travel in BTC. CheapAir: CheapAir.com is an American online travel agency. Dish: A popular Satellite television providers and also an internet service provider accepts BTC. Intuit Labs: Intutit Labs is the company behind Tax preparatory software and accounting software, Quick books and it accepts BTC. QHoster: Hosting and VPS service. There is a neat trick that you can use to spend Bitcoin to a website that doesn’t accept it. The solution is using a Bitcoin debit card. You can get a debit card from website like Xapo, Wirex, CoinBase card to name a few. 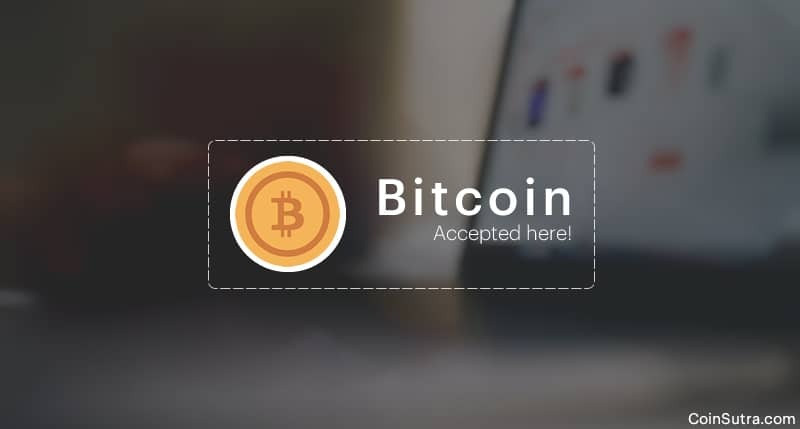 If you are an online or an offline business, you should start accepting Bitcoin. After all, cryptocurrencies also need a helping hand to thrive amongst the masses. But accepting cryptocurrencies like BTC can be very tricky because of their wild volatility. That’s why to make your life simpler, Bitcoin and other cryptocurrency payment gateways and processors are present in the market to insulate you from the wild volatility. For Bitcoins, here is the list of payment processors that you can integrate instantly: 7 Popular Bitcoin Payment Gateways For Merchants. Now it’s time to hear from you: Do you own a business? Or have used BTC at any of these stores/businesses to buy any services or goods? Have you started accepting/spending cryptocurrencies like BTC? How has your experience been? Did I miss any major players/businesses on this list? Do let me know your thoughts in the comments section below! How Long Does It Take To Transfer Bitcoins And Why?